Hendmeid is becoming more popular every day. Exclusive things are highly valued in many parts of the world. Some products are quite expensive, and only a few can afford them. Today there are a lot of examples of how to make this or that piece of decor with your own hands. 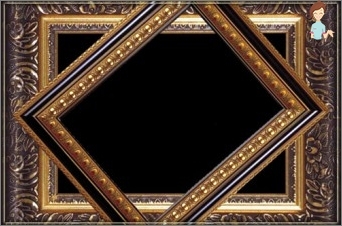 Let us dwell on the options for framing frames for photos and paintings. Thanks to different techniques,Which ideally fits into any interior. 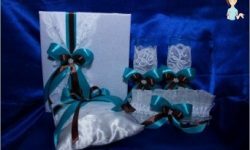 In addition, it will be a perfect gift for any person. So, from the lyrics, let's move on to practice and look at some interesting master classes. The main material is the ceilingPlinth, which is sold in any construction shop. Thanks to the variety of patterns and textures, you can get beautiful framings suitable for both photos, and for paintings or panels. If you use a flexible material, you canGet an oval or round option. To make a frame frame it is necessary to take a plinth made of expanded polystyrene, the size of which directly depends on the desired scale of the product. Take an adhesive suitable for this material, for example, PVA or "Dragon", measuring instruments, knife, acrylic putty and spatula. Still need "Liquid Nails», Brushes and acrylic paints. Now you can paint the frame in the selected color. In fact, everything is ready, it remains only to insert a photo or a picture, fixing it in a newly made frame with liquid nails and place it in the chosen place. At the rear, you can attach a suitable sizeA sheet of cardboard, so that the image is denser, but it is not necessary. By adhering to this instruction, you can make a wooden frame using a floor skirting and nails. Decorative wares from improvised means are notOnly beautiful and original, and cheap. Instead of throwing out an old and unnecessary magazine, we'll make an excellent frame for it. For this product it is necessary to take cardboard, magazines, multicolored threads, "PVA», Scissors, measuring instruments. Start sticking ducts to the base, some bend to make a nice angle. Do this until the entire perimeter is sealed. Make a leg for support. 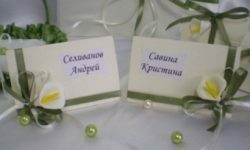 How to make a round frame? Such an original version is suitable for any product, be it photography or embroidery. 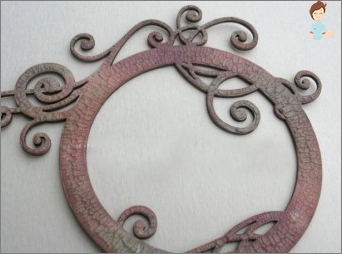 To make a round frame we will be from a dense cardboard and paper or a fabric for a decor. In addition, it is necessary to have tools for measuring, knife, scissors, "PVA", A punch and a loop for hanging the frame. Now you can assemble the product. Place the decorative material on it, and gently glue the teeth that have been made. Insert the lace into the backing and glue it. Stamp so that you can insert a photo. It is a perfect gift for any holiday. 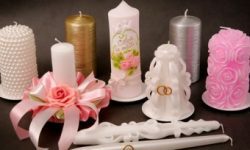 In addition, including the imagination, you can decorate the finished product with various accessories, resulting in a new original version. Such types of framing are suitable for differentProducts, and they can be placed anywhere. There are many options, consider one of them an oval shape. Take the cardboard better from the box, napkins or toilet paper, "PVA", A thick rope, scissors, a knife, acrylic paint (in the master class is used gold), liquid bitumen and paper. Let's go on decorating. To do this, glue the prepared cord around the entire perimeter. You can make a bow out of it. To hang the frame, form a loop and glue it from behind. Now take the golden paint and gently walk it around the perimeter, and from above with bitumen for decoupage. Remove any excess with a napkin. 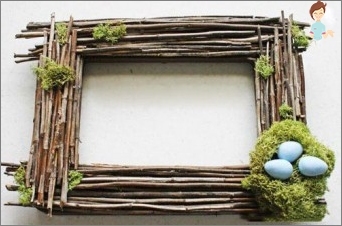 How to make a decorative frame with your own hands? We offer one more version of a beautiful frameFor a photo. It's easy to do it, so you can get kids to work. For this frame, you need to take a thick cardboard, scissors, lacquer, glue, for example, "PVA", Paints, brushes and polished peas or beans. It remains to consolidate the 2 parts so that you can then insert the photo. As you can see, having devoted needlework, you can create a real masterpiece with your own hands for a little while. With its help it will be possible not only to decorate its ownDwelling, and to please a loved one, if you present a frame as a gift. Using the considered master classes and having shown a little imagination, it is possible to come up with new variants of framing on your own.